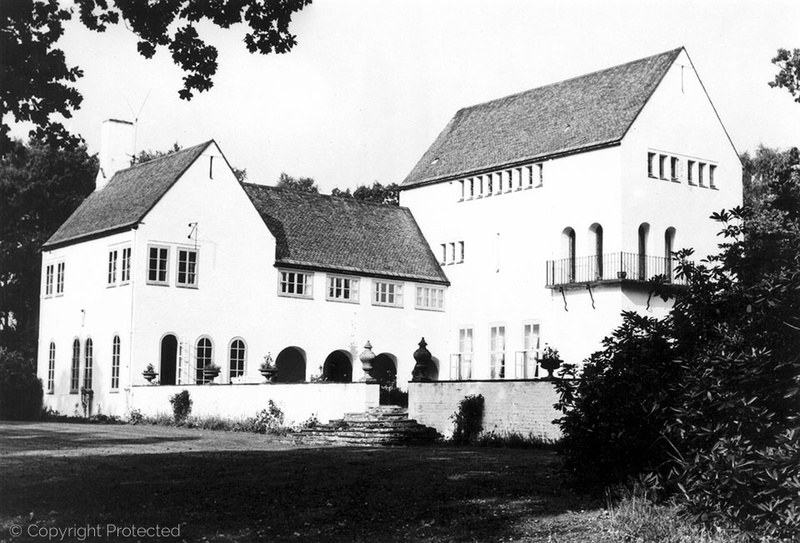 Originally called Birchens Spring, Drummers Yard was built in 1938 by architect J Campbell for C Rissik. During the 1950s it was owned by The Edith Edwards Trust[i] who used it to house children whose had a parent who was suffering from TB. “My family lived in London; my mother was diagnosed with TB and we were sent away to a children’s home; it was a place called Drummers Yard, although we, as children, didn’t know that at the time. To us it was just a big, big white house. We didn’t even know where we were. My brother and I arrived at the house – I was 8 and my brother was 6. I remember standing in a huge hallway and was told to wait for auntie and uncle to come and greet us. This was Auntie May and Uncle Albert who were the House Parents in charge. They had a daughter called Barbra and were assisted by a lady we called Auntie Catherine. There were all very nice to us. The house was enormous, and we soon settled in as kids do. The house had an east and west wing, as well as a huge theatre with a stage that we used to perform plays on. The house was in about 15 acres of woodland; an absolute paradise for children. We all spent many happy hours making camps and all the things that children do and it was all to ourselves. The other children I remember living in the house were the Inkpens, a family of 5 from London, a brother and sister from Reading, so about 9 children in total. We all went to the same school which was St Marys All Saints, Maxwell Road. We would cross the Amersham Road and make our way to school. On our way we would pass a field that had a gate and in the field were 2 donkeys; we would wait for them to come over and feed them bread. I visited Beaconsfield some years ago now and walked past the field which has had houses built upon it but there is a verge to the estate and in amongst the hedge was the gate we used to wait on – its probably still there today. We were all known at the school as the kids from the home, but I don’t remember any of us making friends outside of the home, probably due to not being able to be dropped off or picked up. I do remember when the home was going to close it was announced at assembly and 1 or 2 of us got upset because we were leaving, we were all very settled there I remember. The House Parents were very kind people. Of course, discipline was instilled if necessary; a couple of the Inkpens were a bit of a handful, but we all stuck together. The owner of the Model Village [Bekonscot] would allow us kids from the home free entrance, and we would spend many a happy hour on a Saturday walking around [it]. I loved the model trains that they had. My mother had a photo of all the children at the home. It was snowing, and we are all posing with a snowman, the House Parents and an Alsatian dog called Zeater, who was the House Parent’s pet. Unfortunately, my mother, in her later years, started to destroy all her photos. I asked my sister if she could find this photo, but she could not, so I think it was destroyed. It must have been taken by a local photographer, but I have not been able to trace it (it was 8 x 4, black & white). All in all, I was quite happy at Drummers Yard. It was one of the happier times of my life as a child; I think it was the security that we had. What more could you wish for as a kid, big house, 15 acres of woodland to run around in? Eventually the home was closed and us children were moved on to a home in Margate”. The house was subsequently famous for being the home of the actor Dirk Bogarde who lived in it from 1960-1962. He then sold it to his friend Peter Rogers, maker of the “Carry On” films who lived there for many years. [i] Needs to be verified.